After Gluing, How Long Do I Wait To Walk On My Floors? 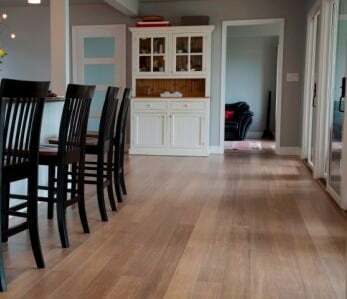 Home › Flooring › How Long after Gluing my Floors Down do I Have to Wait until I Can Walk on Them? How Long after Gluing my Floors Down do I Have to Wait until I Can Walk on Them? 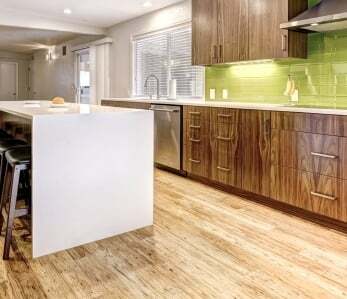 When installing bamboo flooring you have numerous options including floating, nailing, or gluing down. The glue down method provides some distinct advantages, such as sound and moisture insulation. A common question we are asked involves how long of a wait is required to walk on floors after a glue down installation. How Long After Gluing My Floor Down Can I Walk On It? This answer can usually be found on the instructional label on the side of your glue pail. Different adhesive brands will have different cure times, and sometimes it also depends on the humidity and temperature. Most urethane flooring adhesives will fully cure 12-20 hours after they’re laid, depending on the humidity levels of the environment in which they’re installed. It’s generally advised that glued down floors will accept light traffic in 12-15 hours and heavy furniture in 24 hours. Insulation against sound: Some wood glues dampen sound, and may absorb some of the vibration that occurs when people walk on or move objects across the floor. Protects against sub-floor moisture: Moisture barrier glues are also available that eliminate the need for additional underlayment (and therefore save you time during the installation process). 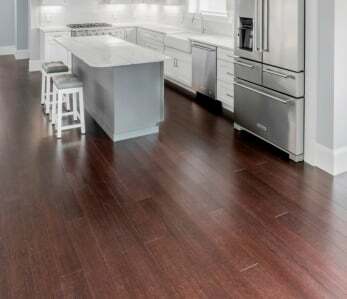 Allows for natural expansion and contraction: Hardwood flooring adhesives are surprisingly elastic, allowing your floor to expand and contract naturally to prevent warping. Limits movement: While glue does contain elastomeric properties, it nonetheless limits movement, ensuring a tight, strong bond and a very secure floor. 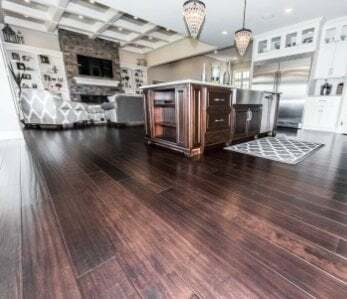 Urethane wood flooring adhesive, which is a moisture-cured urethane that securely adheres planks to plywood, ceramic tile, lvt tile, and other surfaces. Urethane wood flooring adhesive with vapor and sound barrier-which contains added vapor and sound insulation and is ideal for gluing down to concrete or on upper-level applications where soundproofing is desired. 1) What is a moisture-cured urethane? An adhesive that cures or dries when it is exposed to moisture is known as moisture-cured urethane. Moisture-cured urethanes come with a tack time and cure time that is related to temperature and humidity. For example, a container opened in southern Florida may dry in 10 hours but could take up to 18 hours to dry in the high desert of Colorado. Knowing the cure and tack time helps the installer avoid putting boards in too early or too late. 2) How do I know if I need moisture protection? Anytime you are covering a crawl space, concrete, or unconditioned space, you must use Moisture is measured in pounds on concrete slabs. Basic adhesives provide protection for up to three pounds per square foot of moisture. Upon testing your concrete, you may find that it comes back higher than that, in which case moisture protection is required. Remember that a moisture test only records the moisture level on that day, so you should take multiple readings on different days to ensure greater accuracy. Check the upper moisture limit on any adhesive you buy to ensure it meets your requirements. 3) Can you explain the adhesive and sound barrier feature? The IIC and STC tests are sound tests used to rate adhesives and underlayment, and the higher the score the better protection they will provide. Most condos require soundproofing of between 50-60, which can often be achieved by using a glue with a high sound barrier rating. Sound barrier glue eliminates the need for corkboard or other material and allows you to avoid the costs associated with their installation. 4) What about trowels and adhesive remover wipes? eliminate the wet adhesive that drops onto the top of the planks during installation. Once the glue dries it is nearly impossible to remove and , so it is paramount that you use the adhesive wipes while the glue is still wet. When it comes to trowels, the importance of using the right one for the job cannot be overstated. Use the wrong trowel, and you could experience improper spread rate or coverage, thereby rendering the glue useless. In the case of vapor protection, it will nullify the moisture seal, causing your floor to absorb moisture and your boards to cup or curl upward on the ends. Sanding the surface to make it level and even. Filling any low areas to prevent dips, and grind down any bumps. Checking the moisture level of your subfloor to ensure it is within the range recommended by the manufacturer’s technical data sheet. 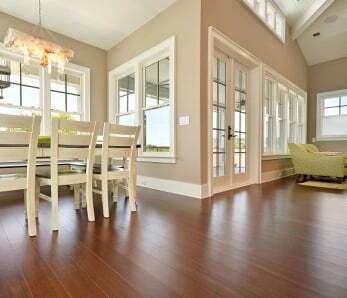 Thoroughly cleaning your floor, which should include removing any existing adhesive residue. You are now ready to begin installation; however, we do not recommend you start laying bamboo just yet. Your flooring contains variations in a pattern that should be accounted for first. Lay out your planks so you can sort them accordingly. Dye lots also vary, which is why sorting is especially important if you are using bamboo from more than one batch. It is a good idea to purchase around 10% more than you anticipate using, as this will ensure you always have material on hand to make repairs with. Leave a ten-millimeter expansion gap around the edges of your room as well as any doorways. Spread the adhesive using a hand trowel held at a 45-degree angle. Your finished product should contain ridges or grooves, but should nonetheless be very smooth. Lay your first row of flooring parallel to the longest exterior wall in your room. Do not slide boards through the adhesive, but rather place the long tongue into the shorter adjoining end and adjust as needed. Make sure each plank is tightly butted against the other before installing the next one. Tap the edges lightly with a soft rubber mallet, using a piece of scrap material as a buffer. Continue working backward from the first row so as not to work directly over top of newly-installed planks. If you are unable to avoid going over top of new planks, use a kneeler board to ensure your weight is evenly distributed. Clean any excess residue off as you go using the adhesive remover wipes or mild soap, water, and a soft cloth. Maintain the room temperature at around 70 degrees or so to keep your glue at an even consistency. When spreading glue, do not work too far ahead of yourself. Check how well your planks are holding by lifting one up every so often to see how secure it is. 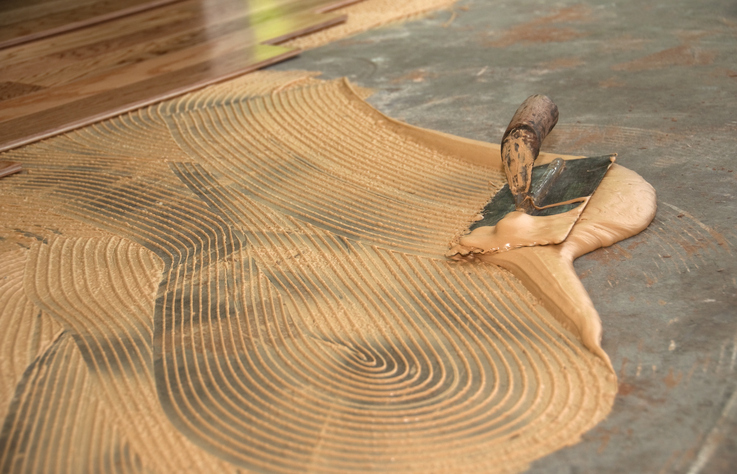 For best results, at least half of the adhesive should “transfer” onto the back of your flooring. Place weighted boxes or objects on the recently glued planks to ensure a strong bond to the floor. You can also “roll” or walk the floor to weight it down. Immediately after laying your floors, you can walk on them lightly in order to “weight” them in place. We advise homeowners to tread lightly or alternately to use a kneeler board as described above. Once you have weighted your floors, please remain off of them entirely for the recommended time that is in the instructional label on the side of the pail. After that time, it is perfectly safe to begin walking on them normally. You may want to wait a bit longer before moving heavy furniture in. Ideally, you should hold off at least 12 hours to ensure the glue has had enough time to set. ‹ My Bamboo Floors Smell! Are They Toxic or Safe?